Moving from Philadelphia, PA to Los Angeles, CA? Los Angeles is the largest city in California and one of the most famous cities in the United States. It is home to Hollywood, beautiful beaches, all kinds of entertainment, and unique people. Los Angeles attracts people from all over the world who come here to fulfill their ambitions. 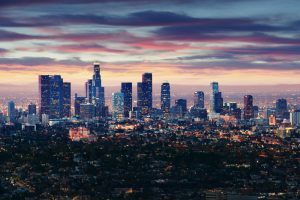 If you are one of the people headed to Los Angeles to take your chance and enjoy everything this city has to offer, do not forget to plan to move your car. Our company is always here to help you ship your vehicle from Philadelphia, PA to Los Angeles, CA! There are over 2,700 miles between Philadelphia and Los Angeles. You would have to drive for about 40 hours to cross the country if you decided to move your car on your own. Without a doubt, you would incur a lot of gas expenses, and you would also need to stay in a motel once or twice during such a long trip. To save money and avoid stress, it is a better idea to use Los Angeles auto shipping services from Philadelphia. At Philadelphia Car Transport, we are always happy to help you with shipping your car across the country. We will deliver your vehicle door to door from Philadelphia to Los Angeles with no hassle for you. Our professional team will take great care of your vehicle and follow all the safety regulations. With Philadelphia Car Transport you will have nothing to worry about! Get free auto shipping quotes from us by requesting them online on our website. You can also call our office with all your questions. Our agents will be happy to assist you!